Complete iOS Guitar Amps and Effects - Hundreds of stunningly authentic amps and effects by Positive Grid - LiveView turns your mobile device into a performance-ready processor - Seamlessly open BIAS AMP models inside BIAS FX with one tap - Download and share thousands of presets from ToneCloud™ WORLD-CLASS GUITAR PROCESSOR BIAS FX Mobile turns your iOS device into an incredible sounding guitar amps and effects processor built on the backbone of our award-winning pro-level software. With an easy-to-use drag-and-drop interface, BIAS FX Mobile comes packed with a library of ultra-realistic boutique amps and a studio full of pro-level effects and the hottest guitar pedals. POWERFUL BIAS ECOSYSTEM The BIAS collection of advanced guitar hardware and software is built on the most robust amps-and-effects engine in the industry. 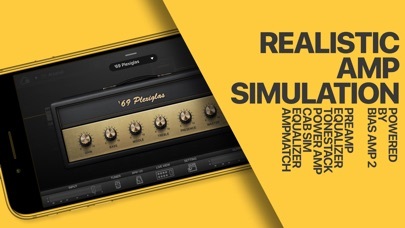 BIAS FX Mobile works seamlessly with BIAS AMP 2 and BIAS Pedal apps to allow limitless customization of guitar amps and pedals. CUTTING EDGE AMP TONE With our penchant for perfection, BIAS FX is built on the backbone of our amazing, ultra-real BIAS AMP 2 tone engine. 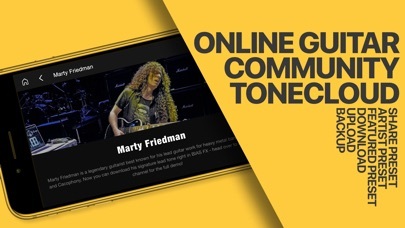 It’s a radically different approach to tone creation. 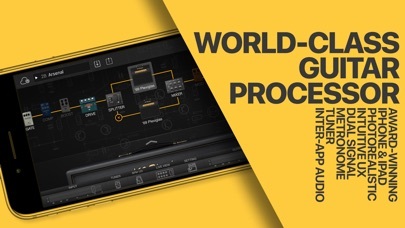 We joined forces with the world’s top artists, engineers and recording studios to ensure our amplifier circuits are mind-blowingly authentic and best in class. The result? Plug in for an extraordinary playing experience with realistic touch response and ultra-responsive dynamics. 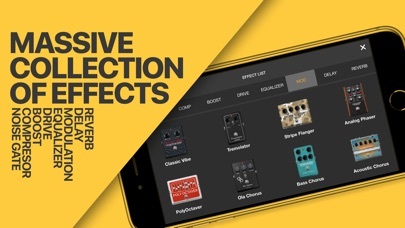 STUNNING EFFECTS The BIAS FX universal app includes incredibly versatile, high-quality effects from vintage pedal simulations to newly added high-end rack effects. Mix, match and tweak to enter new sonic territory and create fantastic sounds never heard before. All effects are designed to work with BIAS FX’s easy-to-use, photo-realistic, drag and drop interface to dial in tone just like on analog studio gear. 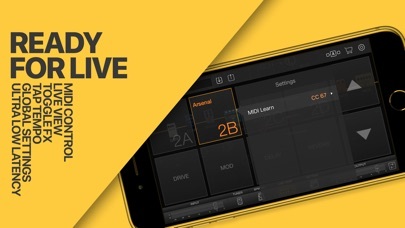 TONECLOUD™ The BIAS FX mobile app also allows users to connect to our ToneCloud, where players can find thousands of amps and effects configurations created by artists, producers and engineers from all over the world. You will never run out of inspiration, as the ToneCloud library grows daily. Settings can easily be downloaded and shared. Key Features: - Extremely intuitive operation - Unrivaled, component-level simulation, analog-like sound quality - Over 20 classic BIAS amps, import any amp models from BIAS AMP 2 - 81 high-quality effect pedals with brand new sound-processing algorithms - 5 ultra-professional rack processors that sound like high-end analog gear - 74 factory presets. Finding your tone is a no-brainer. - Full integration with BIAS AMP 2 gives you unprecedented control over designing your own fully customized amps - Dual signal path and dual amp processing - Brand new splitter switches between and combines dual signal paths, adjusting the level and frequency range for each path to give you more tone-shaping possibilities - LiveView mode lets you recall any preset with a single tap and toggle on/off any single effect or category of effects - Pedalboard View shows all the effects and amps in the currently loaded preset at once - Global Settings optimizes BIAS FX's output to sound the best in any environment—including sending to a mixer, amp head or combo or stack power amp—by letting you EQ and selectively deactivate the app's preamp, tone stack, power amp and cab separately for each destination. - Full MIDI compatible - Supports IAA (Inter App Audio) to expand your sound creativities. Supported Audio Interface: iRig (all series), Apogee Jam/Jam Plus, Focusrite iTrack Solo, Shure MVi, Korg plugKEY, iConnect AUDIO and all MFi or Class Compliant audio interfaces with Lightning to USB adapter. Join us at www.positivegrid.com, more is coming, we are just getting started! I love this app, I’ve compared it to Amplitube and ToneBridge and this one works way better than both, it doesn’t give me deafening feedback on heavily distorted tones and has better sounding effects. My only beef with this app though is that the tuner is super off. I’m have my guitar in standard and it shows the E as D. I even used Fender Tune to check if my guitar wasn’t just super down-tuned, and Fender Tune is awesome. I love this app but please fix the tuner. Update: I m getting annoyed after 2 updates after my first review the tuner still isn’t fixed, hurry with fixing it!!! Beyond frustrated. The amps sound great but there’s so much noise in the signal. Everything from clicks, screeching sounds and feedback. Using an iPhone XS Max with an iRig HD2 and no amount of adjustments makes any difference. In addition the poly octaver NEVER works. Then there’s the list of random bugs such as amp icons disappear but are still operational. Paid to have everything and currently the app is unusable. Tonebridge and AmpliTube work without issue. Really want this to be stable because when firing on all cylinders BiasFx is an untouchable beast but right now there’s no way I’d trust this not to take a dump. So... screw us who have spent money on JamUp packages and Bias Amp2 right? I’m assuming this is Positive Grids competition to Amplitube by IK Multimedia. I can admit, while IK Multi makes great hardware like iRig and iRig Micro Amp; in terms of software, Positive Grid is a step ahead. It honestly works even better than IKs own software when it’s plugged into IKs hardware. I am ecstatic to see this, it’s pretty much like Jam Up, but now more focused. But... I have re-buy everything? SCREW THAT. It doesn’t even link to Bias Amp 2 that I have already purchased! Jam Up works just fine for now and I’ll stick to that since I’ve already spent enough money on expanding on it. Honestly, I was just about to buy even more effects/amps for it, but now seeing this. I’m VERY hesitant. With this new thing out we can best bet that they’ll slowly phase out Jam Up and eventually stop supporting it. Which means people who have spent lots of money on all the packages, amp models and effects and etc can all screw themselves. This is just another money grab move by another corporation. If not then prove me wrong Positive Grid. Will change it back to 5stars when it supports the resolution of ipad pro 11. Really great app. I’m blown away by this amp sim. I’ve used most of them. Most recently AmpKitPlus. But, after using this, I’ll never go back. As they turned there back on it a long time ago. Didn’t know till it was too late. But, Luckily, the Peavey Link 2 works great with Bias Fx. I’ve essentially turned my iPhone 8 into an Axe fx unit. I unlocked the full version for $30. How can you go wrong? Lovin’ it!! Just takes a little time to tweak in the right tones, and you can replicate any amp, stompbox, cabinet, speaker IR, or processor on the planet. Highly recommend in conjunction with Bias Amp2. Invest in ALL the plug-in bundles. Loads of fun. Sounds great on the iPhone, in a hotel room with headphones; but I mainly use it on my iPad for studio sessions. This isn’t a toy; this is professional-level gear. Take your time, get to know it, and you’ll be amazed at the tonal possibilities! It’s good so far, but I bought the Ultimate License on my iPad, thinking it would unlock absolutely everything, since the blurb said that’s what it does, and it hasn’t. I don’t know if I’m just an idiot or not, but I can’t access some of the amps and I’d really like to. If you guys can fix that, definitely giving it a 5/5. Ok, I have Jamup Pro, bias amp 2 both with amps and FX, both that have so many hiccups I just had to stop using it, so what is this app for? Background: I use this app heavily and own every in-app purchase. The current version freezes but does not crash when I hook up my audio interface through the iPhone camera adaptor. I can not restore an expansion pack, and it is one I use often, been using these products for some years now, maybe one has to repurchase after so many years of use? !